Minim = a musical note with the time value of half a semibreve or two crotchets. It is written as an open note head with a stem. The first quatrain … when in the middle of a task something to the peripheral arrests attention … in this instant a voice from the trees … as though someone else is speaking and there is communion with the environment … the woman stops what she is doing and for one brief moment there is an appreciation of life … the joy of just being.… there is a gift of thanks … or putting it another way this can be thought of as a prayer of thanks whether or not just a thank you for life or whether a thank you to another ‘God’. The second quatrain … prayers happen regardless of any formal faith … night is the time when the mind is vulnerable … and often in those sleep hours thoughts occur seemingly out of nowhere… and if the truth of the matter unravels there is usually some pain and discomfort from this communion in any resolution. Maybe hearing a piece of music gives association to something way back from his youth … perhaps to a time when the man was more motivated and a time when he was following his young heart with strong purpose … and again this may be painful and the man may seek consolation if reflecting on unfilled dreams. I do like this sonnet as it widens the concept of traditional prayer and brings prayer down to the basics of everyday communication in the living of life. And to end, – a prayer that our daily transactions are appropriate as we negotiate life! 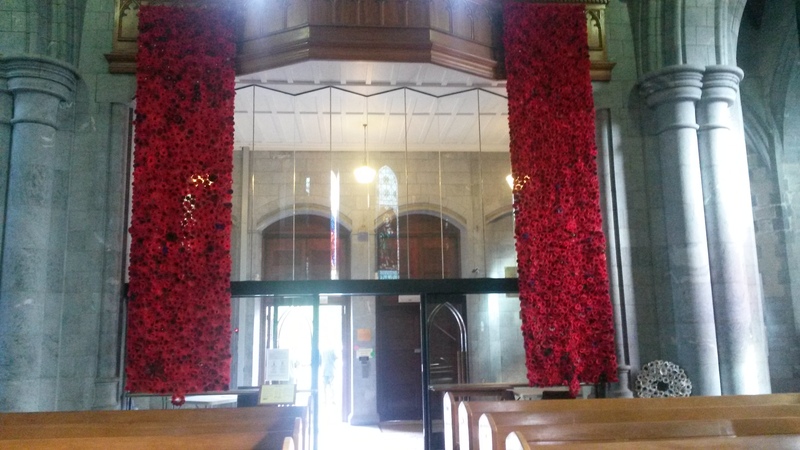 Two trains of roses have been placed down the inside the back wall at the entry of Nelson Cathedral, New Zealand. The following is my choice of a war poem and it is ANZAC (Australian and New Zealand Army Corps) day today when the ‘World War 1 Gallipoli’ campaign is on the minds of Australians and New Zealanders. This year also marks hundred years since the birth of Judith Wright in 1915. This is a generic poem about pending dark days as war approaches. since blood’s red thread still binds us fast in history? The first stanza reminds me of the time I was staying in a rondavel in a valley in South Africa when on the way to Durban. The trains disturbed my sleep as high up they trundled through tunnels in the hills making an eerie sound at the same time. Trains are very powerful images and coming suddenly at night representative of the foreboding onset of war. And more importantly these lines show how both old and young would be affected. The young might dream of adventure unknowing of the nature of war and being easily misled by any recruitment drive, whereas the old know only too well what is at hand and their hope for the the next generation is shattered like broken glass. The peace of the orchard is now clouded by the events which were unfolding represented by the trail of black smoke over white spring blossom. The trains are going north with guns and this was appropriate to the Australia situation as Darwin was first in line in the Second World War. The second stanza likens the war-trait in the human condition to a tiger within the blood of all generations. It seems this tiger will always be present to trouble each generation and as in the first stanza reeking a trail across our dreams for peace (orchards). And how can mind be sober when it has to confront the terror of this tiger. It seems that the mind of man has to continually deal with war in whatever form. The last lines highligh the manic-force with which the war-cry manifests, represented by the trains travelling on iron errands, rather than iron rails. It is an animal cry reflecting the ever present unstoppable base elements of the human condition. As the world gets smaller and smaller war and conflict is quicky brought to our attention by the media – wherever it is occuring, so you could say that ‘train-noise’ is a more frequent visitor to the background of the mind. Whether this awareness makes the world better equiped to deal with such situations is another matter – but we live in hope. We give thanks that we are lucky enough to live where peace prevails! I have also commented on this poem on my previous Site. Will humanity progress this year? Has God gone to sleep in his arm chair?